I had been craving this soup for a couple of weeks now, but I don't often make it because two of my three children won't eat it (they are simply not onion fans). So, when I do make it, it means I have to make something else for them to eat. And, honestly, who enjoys cooking two different dinners at the end of the day? Well, Saturday was the perfect opportunity for me to make French Onion Soup, however, since my thirteen-year old was off at a band lock-in and our five-year old was spending the day at her cousin's house. That meant that it was just my husband, my son and I at home for dinner ... and we all love, love, love this soup. Please believe when I tell you that although the cooking time seems lengthy, the results are so totally worth it. You may call it labor intensive, but I call it a labor of love. The recipe is actually a very simple one ... just know that the onions really need time to cook slowly over very low heat so that they will caramelize correctly. Also, the recipe does call for dry sherry or red wine. I have made this soup without either of those ingredients and it is still amazing, but the sherry or wine does add a depth of flavor that will not be present if you omit. 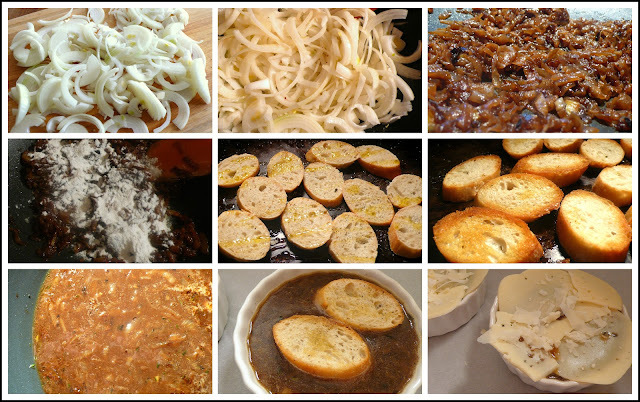 My french onion soup recipe is adapted from a 1999 issue of Martha Stewart Living. Yields 4 - 6 servings (depending on the size of your soup crocks/bowls). Melt the butter in a large stock pot or Dutch oven over low heat. Add in the onions and stir to coat onions in the melted butter. Spread them out in as thin of a layer as possible. Sprinkle with sugar. Cook - stirring just as needed to keep onions from sticking - until they are soft, golden brown and beginning to caramelize. This will take 30 minutes to one hour. Increase heat to medium. Sprinkle in the flour. Stir to incorporate. Cook for about 3 - 4 minutes. Sprinkle in the thyme leaves. Add in the sherry or wine, if using, and scrape the bottom of the pan while bringing liquid to a simmer. Add in the stock. Stir. Allow to cook for another 30 minutes or so to allow the flavors to deepen. In the meantime, drizzle the bread slices with a little olive oil. Season with salt and pepper. Bake on a baking tray in a 350 degree oven for about 10 - 15 minutes. Turn over once during baking. You're just wanting to crisp and dry up the bread a bit. Once removed, preheat oven to broil or its hottest temperature. Ladle soup into individual soup crocks or oven-safe bowls. Top with 2 or 3 bread slices and some cheese. Place under the broiler in oven until cheese is melted and bubbly. Watch it closely so that it doesn't burn. Whoa, this is making my mouth water, and it's only 9 am! Beautiful photo - i'm drooling! Hi, Lori. 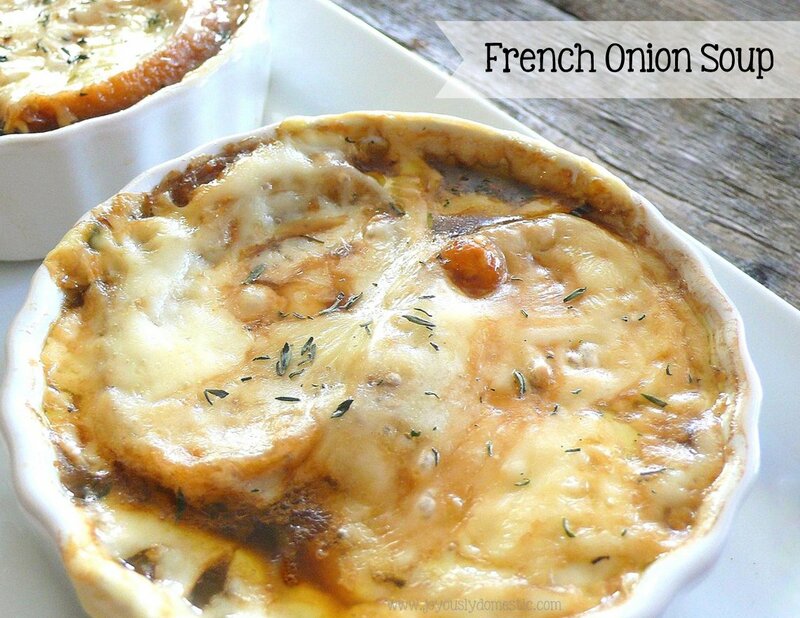 It does take a great deal of patience to wait for those onions to caramelize, doesn't it? It is soooo worth it, though, when it's done right! One of my favorite soups ever! And, it's actually pretty simple as long as you can make it thru the cooking time. WOW! This post is so drool worthy. I really wish I had some to eat right now. I pinned the recipe and will be making VERY soon! Thanks, Meghan! :) Hopefully you enjoy it! JD on foodgawker - Finally!